1. Crisis in Turkey: The Turkish lira plunged as much as 11% to a record low against the dollar before recovering some losses in volatile trading. The currency had already plummeted more than 20% last week as a political clash with the United States intensified and authorities in Turkey failed to take steps to reassure investors. Turkish President Recep Tayyip Erdogan has dismissed calls for the country to raise interest rates to try to ease the crisis — and has lashed out at the United States. The lira was trading down nearly 6% at 4:30 a.m. ET. 2. Global fallout: European stock markets opened with losses of less than 1% on Monday. Stocks fell 2% in Tokyo and 1.5 % in Hong Kong. There were some signs that the crisis in Turkey was beginning to spread to other markets. Currencies were hit in South Africa, Mexico, Argentina and Russia as investors moved into assets perceived to be less risky, such as the dollar, yen and Swiss franc. Investors will keep a close watch on European banks. Data from the Bank for International Settlements show eurozone banks have loans worth over $ 150 billion in Turkey. Italy’s UniCredit (UNCFF) shed 2%, and Spanish lender BBVA dropped nearly 3%. France’s BNP Paribas (BNPQF) was off by 0.8% and Deutsche Bank (DB) fell 1.6%. 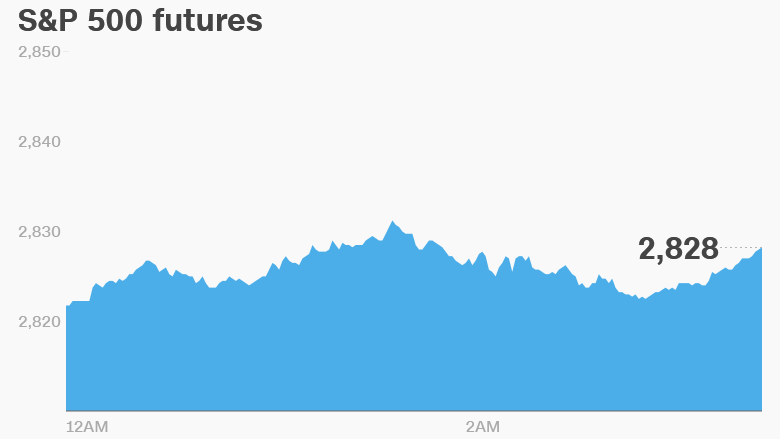 US stock futures were lower. On Friday, the Dow dropped 0.8% as investors reacted to the crisis in Turkey, while the S&P 500 and Nasdaq shed 0.7%. 3. Bayer pain: Shares in Bayer dropped 11% in Frankfurt after a US jury awarded $ 289 million in damages to a former school groundskeeper, ruling that his cancer was caused by popular weedkiller Roundup. Roundup is made by Monsanto, the agricultural company that Bayer (BAYRY) bought earlier this year. Dewayne Johnson’s legal victory could set a massive precedent for thousands of other cases claiming the herbicide causes non-Hodgkin’s lymphoma. 5. Earnings and economics: Sysco (SYY) will earnings before the open Monday. Equifax (EFX) is holding an investor meeting on Monday. The company is still reeling from a massive security hack that exposed the private information, like tax IDs and driver’s license details, of 145.5 million customers.